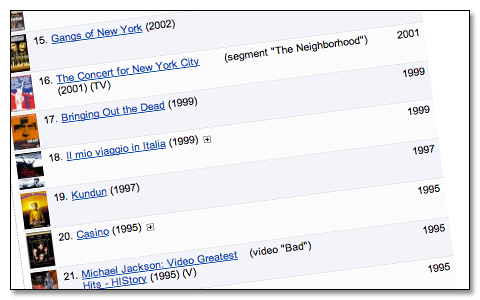 Above: A sample from Martin Scorsese’s IMDb entry, as seen in the new layout. Srs, what is the point? The posters are so tiny that you might as well just have a blob of colour next to each title. They’re also missing a hell of a lot of posters, which leaves most lists with big white gaps between the blobs. The titles are now so far apart that someone like Martin, who has a lot of movies to his name, ends up w ith a page that takes about 4 hours to scroll through. There is absolutely no need to have the year of release both in brackets after the title and aligned to the right.